Nine years ago to the day I was on a Boeing 747 jet zooming across the Pacific Ocean to Sydney, Australia. I spent three months in this fantastic country. Recently, I found David's Images of Nature Photography blog, and his pictures have brought me right back to that country. 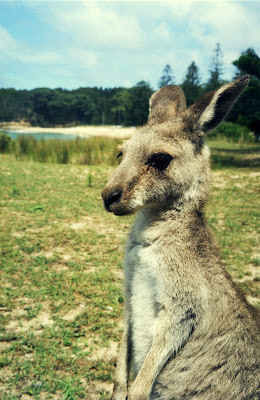 This shot of a very tame gray kangaroo is from South Durras Beach, New South Wales. We have friends that live in Bangor (Sydney). They've been here to visit us twice and have invited us to come visit them there. We would LOVE to, but there is the matter of paying for the plane tickets! That, and my husband hates flying. I sure hope I get to go someday though! I would definitely take advantage of that offer. Australia is a wonderful place to vacation. It is just amazing. Yes, the tickets are expensive. Maybe Skybus will sell $10 tickets to Sydney some day? Although their prices are low, a fare that low would be insane. When you do go, do tell us about your trip!